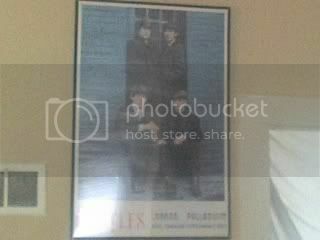 I recently moved into my first house with two other roomates, who are also big Beatles fans. 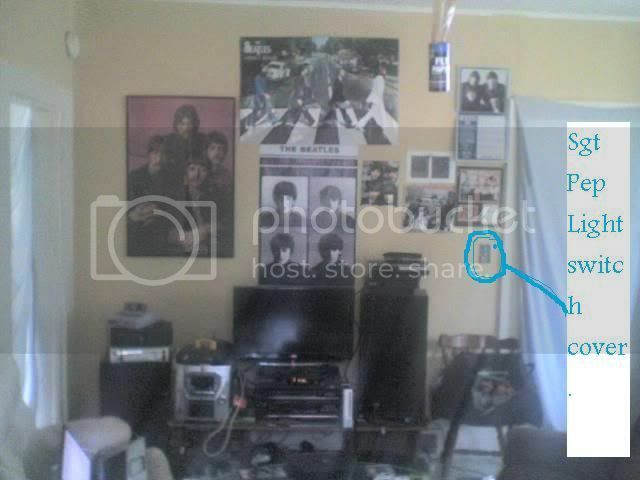 So we have started to slowly cover the walls in our main room/hang out spot with Beatles pictures and posters. I really like the Sgt Pepper moustache pic, and the Beatles 1963 pic, as I think both are pretty old; and could be rare? Show off your memorabilia here! 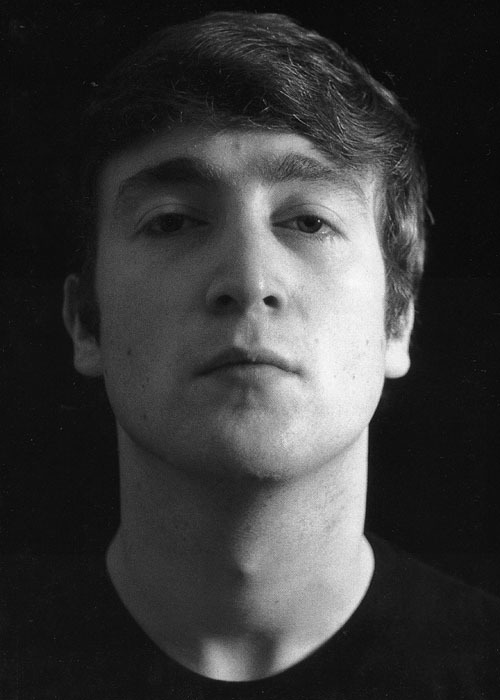 This awesome artist did drawings with his charcoal on flat canvas and I found one of Paul and one of John. I couldn't afford both so I went with the most realistic looking one - Paul. It's beautiful. A picture of that posted here would be welcome. I'd like to see it myself. 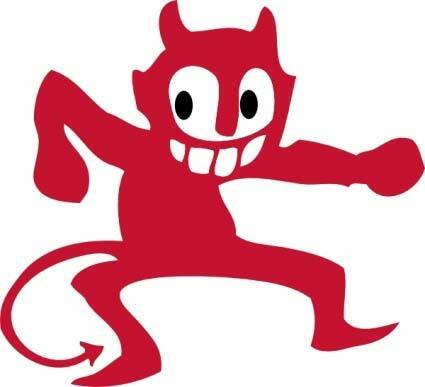 BTW Red Lennon that room is going to be awesome!! I wish I still had the original White Album posters I had on my walls when I was a child. I dunno what happened to them. I want to decorate my room with some Beatles stuff but to be honest, I don't feel like having posters on my walls anymore. 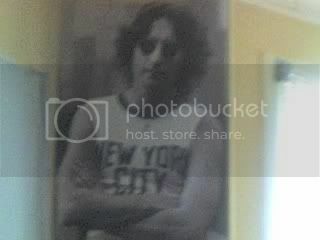 I have some Beatle pics in my board though, with my up and coming tour ticket. mithveaen - If your walls or ceilings are painted pure white, you can pretend you have White Album posters! Just point and say, "look closer - the album cover is there, I swear!" P.S. I know you were referring to the posters that came WITH the album, but it would still be funny watching people squinting at your walls trying to make out the album cover. I tried to convince my wife to let me stencil The Beatles on our bedroom ceiling to make it look as though it was a giant album cover. She loves the Beatles as well, but was not amused. mithveaen – If your walls or ceilings are painted pure white, you can pretend you have White Album posters! Just point and say, "look closer – the album cover is there, I swear!" ROFLMAOOOOOOOOOOOOOOOOOOOOO!!!!!!!!!!!!!! I just need to have a weird serial number somewhere on the wall… great idea I love it! Actually my walls are green and .. light yellow with a nice tiled design in the middle. But now I think about it, I want to have something Beatles related on them.. it's time for a change! walls trying to make out the album cover. That would be soo cool Zig! Actually it would be cool having Revolver 's cover on a wall. I could photocopy the album as big as I need it and then ask my nephew-to-be to stencil it on the wall!! 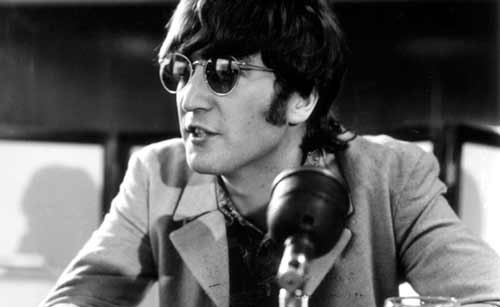 BTW Red Lennon I saw that John's pic with his New York City on a park when I went to Mexico last May and I loved it. I think I'm going to get that one. If I just could find my avatar in a poster.. that would be awesome. I'd choose Paul's up and coming tour poster.. and Ringo, I'd love to have that one of Beatles LOL of Ringo approves of you. BTW Guys.. do you remember this? I just moved into my university dorm today (aiyee!) and first thing I did was find a spot for "my boys". 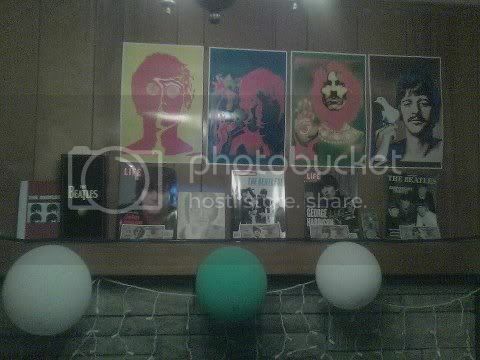 I put my poster of the boys in 1964 over an unsightly bulletin board and my four framed 1967 headshots beside my bed. *sib* I did have to leave behind my picture of the boys on vacation in '65. My mum wouldn't have any of it. Though, my John calendar has found its place on my magnet board. Moved into another new place and really like the setup I got above the fireplace! What do you think? I also got the other 11 posters scattered throughout the room. 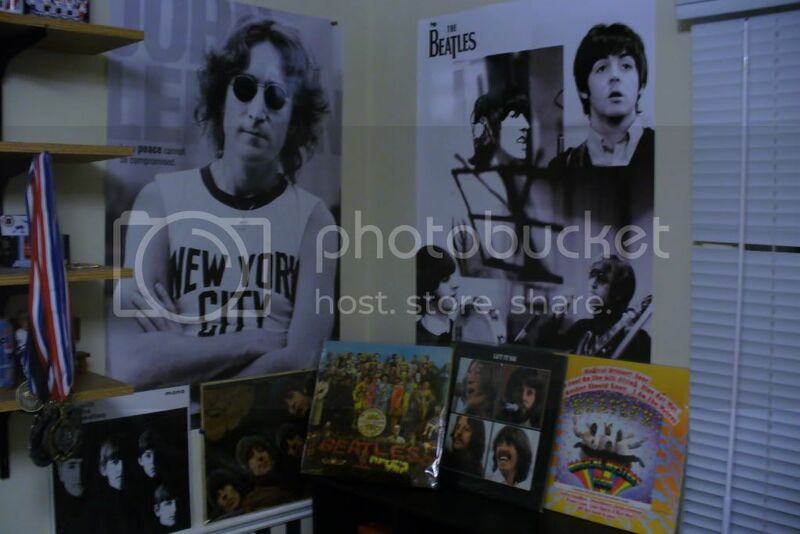 Anybody want to share some of their more collectable, rare or original Beatle items? Other than a lot of books, I have a good number of original vinyls and singles. My favourite has to be my "Let It Be " 45, which is (sadly) my only 45 with a picture sleeve. Another great thing I got a hold of is an original set list from Paul's show in Toronto in 2005. A friend of a friend does stage rigging for some pretty major acts, and he nabbed it for me. I think one of the few things I have that's fairly *interesting* (too scratched to be valuable) is an original '64 "She Loves You " single on the Canadian Capitol label, the familiar orange/yellow swirl. The USA ones were on Swan. It was bought by my mother, and nobody in our family thought to treat records with care in those days! In the mid '80s, I found a mono Sgt. Pepper that was, again, too scratched to be enjoyable. And I still kick myself for GETTING RID OF IT!, which I wouldn't have done if I had any idea how scarce it was. But it was the first time I owned an actual copy of the album, rather than one merely taped off the radio, and I wanted a stereo copy, maaaan. 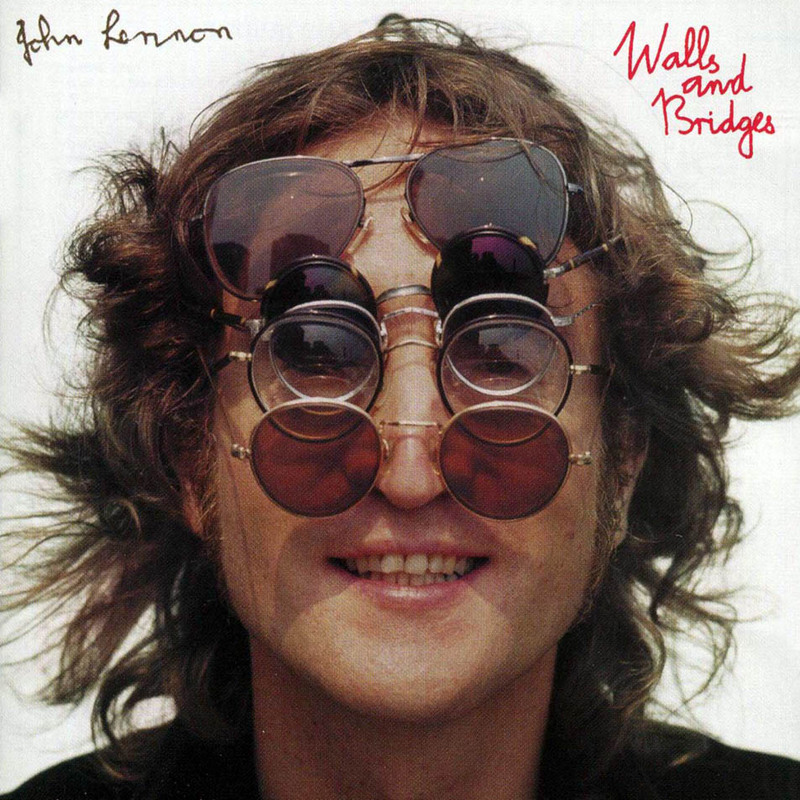 Well I've got Walls And Bridges original vinyl print if that counts. I kick myself for some mistakes I made as a youth. About 20 years ago when everyone was damned sure that CDs were the be-all end-all, I got rid of most of my vinyl. Including three 7-inch picture discs and a 12-inch interview picture disc. Here I am years later, so totally regretting that. Oh yeah... I also have an 'Anthology 2 ' promo CD, which has 10 tracks and a fully annotated booklet. As well, I picked up the "Baby It's You ", "Free As A Bird " and "Real Love " CD singles with bonus tracks. I've got a Rubber Soul mirror that my great-grandma had sitting in her closet for forty years. Then I got a bunch of vinyls and magazines. I got my first Beatles vinyl--Magical Mystery Tour --two days ago! It was one of my most crowning achievements, I must say. I also have Greek hand-carved and hand-painted Beatles Russian dolls, a music box that plays "Imagine ", pins from the early '60s, John and Yoko pins, an Abbey Road mirror, a set of tumblers with their singles painted on them and another set of tumblers with their Let It Be pictures painted on them, various books and magazines, journals, all of their movies (besides Let It Be , of course...), a few tin lunch boxes, Trivial Pursuit, Monopoly, all of their CDs, a fleece blanket, a couple of calendars, all of John's books (which I only read when I need comfort: his whimsical poetry always makes me feel better), and--of course--posters (one of which is a 3D one of John in the studio!). Do things like badges count?? They're not worth anything but I love them anyway. Apart from that I have original vinyl (all of their albums apart from MMT, AR and Revolver . And White Album , Sgt Pepper and Help ! reissues), a few CD's and 3 or 4 singles (on vinyl) . Plenty of books to keep me occupied, all their films apart from Let It Be 🙁 , Anthology, George Harrison : Living In The Material World (which is a must) and things like t-shirts, bags and a hoody with the Cavern logo on. And solo memorabilia, All Things Must Pass original and the poster (yes, only the poster) from the Imagine LP. Plus a top with John on and his signature (love it!). The most important thing i own is a beatles watch i got in 1996/7. Its more sentimental value than anything else but it is official. Oh i never bought that piece of overpriced pointlessness, its existence and how it came into being bugs the hell out of me - i'll save you the pleasure of my feelings on the matter.